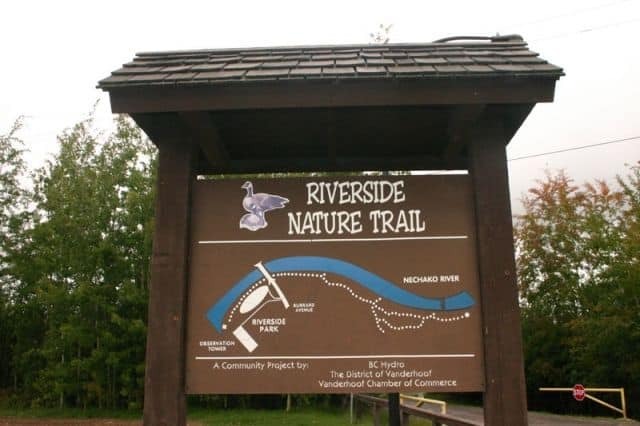 Riverside Park Nature Trail in Vanderhoof, British Columbia, Canada is the most visited community park located in the village of Vanderhoof. 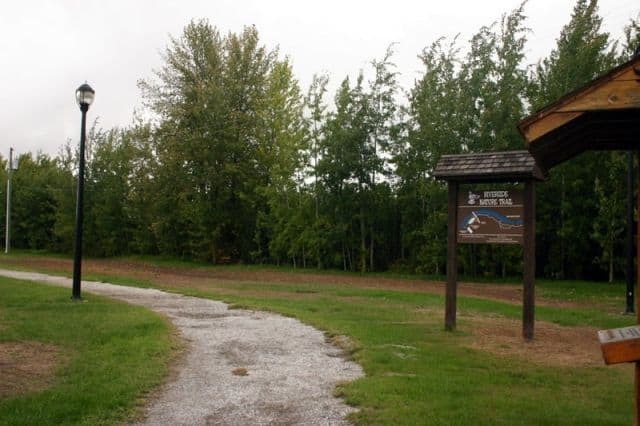 The park was established in 1944 and rests on the shores of the mighty Nechako River north of the community. The park is a recreation destination and is part of a designated bird sanctuary. The park is a prime destination to visit when in Vanderhoof for explorers interested in viewing migratory birds, resting in the Nechako River Bird Sanctuary. Bird viewing points are found along the local nature trail starting from the park and from a large viewing platform fronting the river in the park. It is a large 2 storey wooden viewing platform ideal for viewing the local bird wildlife. In the park there is a large grassy field for frisbee, bocce ball and playing catch. And on the other side of the parking area is a covered wooden picnic shelter, a playground and some picnic tables. At the entrance of the park is a campground. There is some pit toilets in the day use area of the park designated for the general public. 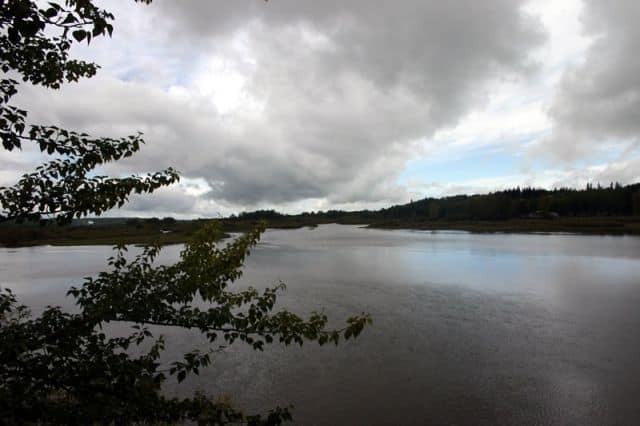 In the day use area of the park there is a nature walking trail which follows the shore of the Nechako River eventually connecting to View Street. The walking path is used heavily by the locals for walks, jogs and birdwatching. In some seasons the path can be closed due to the rising river levels. The trailhead to the walkway is best accessed in Riverside Park. 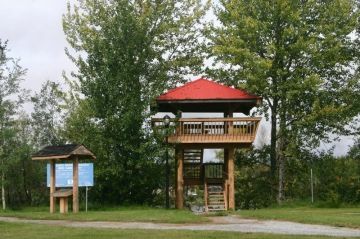 The three story wooden viewing platform looking over the Nechako River dominates the park. The well constructed birdwatching platform is well over 15 feet tall and provides a good view of the bird sanctuary. The Nechako River runs through the community of Vanderhoof and neighbours Riverside Park. The entire river flows over 516 kilometres from the Coast Mountains to Burns Lake and then north to Fort Fraser turning east into Vanderhoof and eventually hooking up with the Fraser River in Prince George.